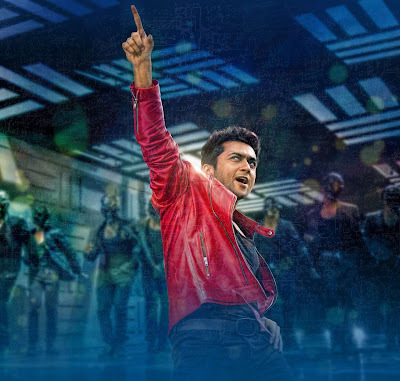 “MaattrraaN” as the name suggest the movie has a changing story line, which is the main highlight of K.V Anand sir’s movie. Maattrraan is really a “Super Hit” film which contains everything that is hard to keep joined. It is touted as a conjoined twins film but, the movie has much more themes. The film involves an international social issue which carries different stages (Example: Olympics). The graphics used in “MaattrraaN” is very exciting and it is really a great visual treat for our eyes. As we know the songs are already declared as chartbusters the BGM also a very good one. The first half fight scene in which conjoined twins are fighting was out of the world and the BGM is amazing. Peter Hein and Harris Jayaraj deserve a great standing innovation for these scenes making extra-ordinary. The Movie “MaattrraaN” includes everything that is on the place. The movie contains Action, Romance, Social message, Twists & Turns, Comedy, Great graphics, Dance, Locations and much more. K.V Anand sir truly directed internationally and each and everyone who involved in this deserve a great place in the industry and they done their job extremely well. MaattrraaN Rating: 4 Out of 5. Casting is very important for any movie. K.V Anand sir done good job, by casting the correct people for perfect matching. Suriya : Suriya is the one who carries the film at from beginning to the end. There is no doubt he acted very beautifully and the action sequences, Dance, Emotion scenes are extra-ordinary. He played the major part of the movie and done 100% perfectly. The conjoined twins which is very difficult to play but, Suriya plays these roles with ease and grace. We can see the hard work taken by him in every shot of the film. Kajal: The “Beauty Queen” plays an important role in the movie. She romanced Suriya well and the chemistry between them works. She is like a “Gorgeous angel” throughout the movie and you can stare at her throughout the movie. Sachin Khadhekar: One of the important role in the movie was carried by this award winning artist. He played his part very well and he is a must needed artist in this movie. Tara: She also an award winning artist plays a beautiful role in this movie. Her expressions are very good especially in the song “Yaaro Yaaro” song. “MaattrraaN” is now ruling the Box office. The Movie “MaattrraaN” is released over 1200+ screens and many theatres are joining to this list. First day collection (Friday): 9.5 Crores. After releasing within three days “MaattrraaN” collected approximately 28 Crores. Guys, write your review about "Maattrraan" in comment box.